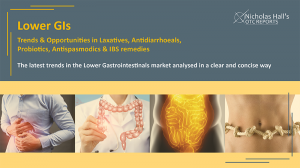 LONDON, GREATER LONDON, UNITED KINGDOM, UK, March 21, 2019 /EINPresswire.com/ — The dynamic lower GIs category – comprising laxatives, antidiarrhoeals, antispasmodics & IBS remedies, plus gut health probiotics – is currently outperforming the consumer health market overall, according to a new report from Nicholas Hall. Key growth drivers include stressful modern lifestyles and unhealthy diets leading to more GI complaints; high-profile consumer promotion (much of it educational); new product development (including new formats, increased efficacy and multi-symptom presentations); and pharmacist brand recommendations (in pharmacy-dominated markets). Probiotics form the fastest-growing category thanks to launch activity, expansion of digestive positionings and growing niche for combination products. Looking at the forecasts, Lower GIs are set for year-on-year growth, with probiotics and antidiarrhoeals the strongest performers. Probiotics are particularly well-positioned for growth via significant scope for innovation. Positioning diversification offers one route to success; products which offer multiple health benefits (e.g. fibre supplements with cholesterol or blood sugar management benefits) look set to grow. Natural brands will be a driver in several categories, while marketers continue to invest in informative advertising and promotion to encourage self-care for digestive issues. Next Next post: World TB Day 2019: TB Patient's Contemporary Account Accepted into the Holdings of the Robert Koch Library, Berlin.